Eureka, Calif., population 27,177, is the only municipality in the nation to adopt the state’s seal as its own. At her feet crouches a grizzly bear munching on grape vines and a sheaf of wheat, emblematic of the fauna and agriculture of the area. A gold miner can be seen swinging a pickax. Next to him lie a shovel and rocker box, which was used to sift fine gold particles from valueless detritus. Ships sail the harbor against a backdrop of the Sierra Nevada. Arced around the top of the round seal are 31 stars, symbolizing California’s rank as the 31st state admitted to the union. Eureka is situated on Humboldt Bay, the state’s second largest bay and the largest deepwater port along a 500-mile stretch of California’s Pacific coast. 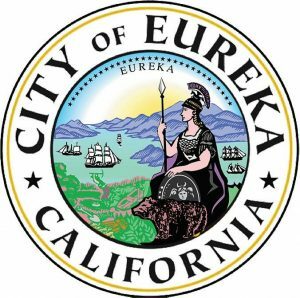 The settlement of Eureka, founded May 13, 1850, was noted for its lumber industry, gold mining and prolific commercial fishing. Its first post office opened in 1853. By the time its charter was granted in 1856, Eureka processed 220,000 board feet of lumber every day. Commercial fishing was another economic mainstay for Eureka. Salmon, tuna, Dungeness crab and shrimp were popular catches and the annual total landings peaked at 36.9 million pounds in 1981. Timber continues to serve as a major industry in Eureka, but mining and fishing have been replaced by tourism, healthcare and services. But the aesthetics of bygone days has been carefully preserved and the entire city is designated a state historic landmark. Old Town Eureka, the original downtown area, has been restored into a vibrant arts center. Old Town, containing more than 150 buildings, has been declared a historical district by the National Register of Historic Places. U.S. 101, which skirts Eureka’s western and northern borders, connects the city to the Oregon state line 100 miles to the north and San Francisco 250 miles south.